Unfortunately, there is no physical FSJuice shop, but you can order the juices online and have them conveniently delivered to your doorstep—they’re delivered in a nice FSJuice cooler bag. The juices can be ordered online, directly on the company website or via fieldschina.com. They have an assortment of cold-press juices with a 3-day shelf life, NFC juices (Not From Concentrate) with a 28-day shelf life, and various choices of Kombucha. The Restore juice is delicious—it tastes like oatmeal in a bottle. FSJuice usually has promotions going on throughout the year, so check their website for promo codes. FSJuice also offers a variety of juice package plans, for those who want to do a juice cleanse or those who want to add more juices to their diet. Farmhouse Juice does have a physical shop, and orders can also be done online. Farmhouse juices are 100% cold-pressed, raw and natural. These juices are a bit pricier, but they are really good and well worth the extra renminbi. Farmhouse Juice has a wide selection of favours to choose, including Pumpkin Spice Latte—perfect for the holiday season. 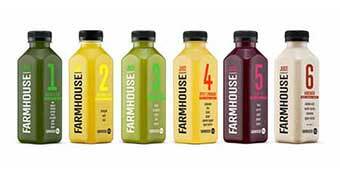 All Farmhouse juices can be ordered on the company website and they’re delivered straight to your door. Farmhouse has launched a cool community Artist Series project, where artists from around the world collaborate with Farmhouse to design art for the juice bottles. Their first artist is an award winning visual artist called Jayson Atienza. For every Artist Series juice purchased a percentage goes to a wonderful organization called Renewal Center, an organization that helps the homeless. You can pick up a fresh-squeezed YOLO juice at Spread the Bagel, Pantry, the YOLO shop, or the juices can be ordered on the company website. You have the option of ordering a juice cleanse package or an individual juice. Try the Fatigue Fighter juice, it’s quite tasty and gives you enough energy to start off your day! Free delivery applies only to certain areas of Shanghai; there is a fee for other areas. Make sure to check out the website or call to determine the delivery fee. YOLO juices are 100% raw and unpasteurized. They don’t have any additives or preservatives. If you like Kate & Kimi, then you’ll love Lizzy’s All Natural. They have a great selection at affordable prices. These juices are packaged in charming, reusable containers. Lizzy’s All Natural smoothies contain traceable and sustainably sourced ingredients, so you know where those fruits and veggies are coming from. The drinks can be ordered on the company website or on the Kate & Kimi website. They can also be purchased at the shop. If you stop by the shop you might even be able to sample some their delicious favours. The DIY Juicing Option: If you want to do a 3-day juice cleanse and would prefer to have more control over what ingredients you’ll be consuming for the next few days, then the first thing you need is a juicer. If you don’t already have a nice juicer, purchase one at your local electronics shop or on Taobao or Amazon. As for the ingredients, you can shop for some fresh produce at your local grocery store. But if you want to make life a little easier, check out the Kate & Kimi website; they offer Easy Boxes (a huge box full of lots of fresh produce). The Super Juicer Easy Box has all the ingredients needed for a successful juice detox. The ingredients may vary, but the usual The Super Juicer boxes include over 14 kg of ginger, kale, tomatoes, lemons, carrots, oranges, beetroots, celery, spinach, and basil. If you want to add some extra herbs to your delivery, just leave a message in the comment box, and the extra herbs will be free of charge. Since The Super Juicer box is over 200RMB, there’s no delivery fee. These quality fruit juices in China are ridiculously expensive. In Germany or Austria you can buy pure fruit juices of any imaginable fruit (either from or not from concentrate), one liter between 7 and 15 RMB. The better option in China is probably to buy a good juicer and make your own juice.